Announcing: Go Mt. Airy Monday Markets! Following Lovett Memorial Library’s reopening in December 2017, the newly renovated and redesigned adjacent Lovett Park reopened in May 2018—and was promptly met with growing pains from construction and a really wet summer. But it gave us time to rethink and reevaluate both the landscape and the programming. And for 2019, it begins with Monday Markets, thanks to the generous support of Chestnut Hill Hospital. 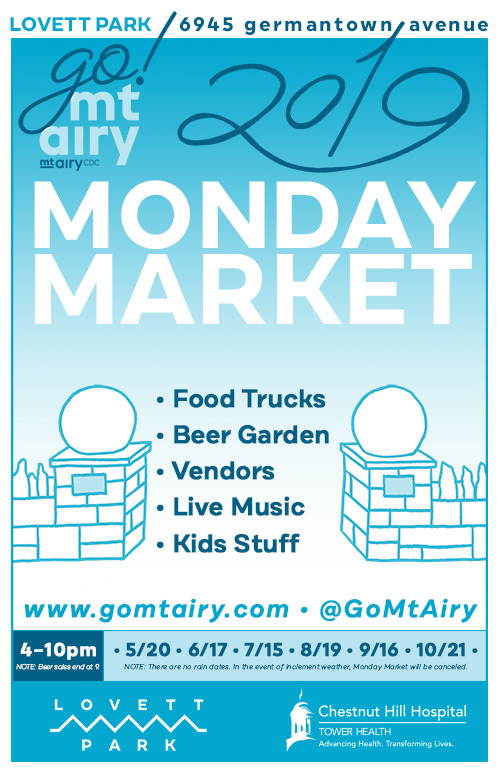 At Monday Markets, we’ll have food trucks, live performances, arts and craft vendors, kids activities, and all new for 2019, a beer garden. PLEASE NOTE: there are no rain dates; if it rains, that day’s market will be canceled.